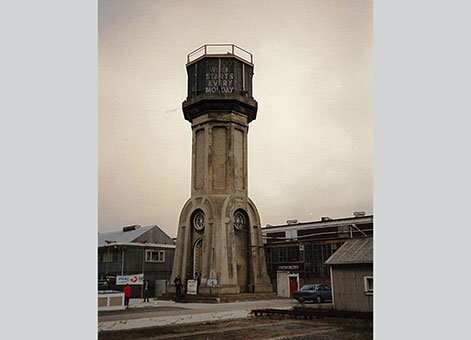 This water tower was one of New Zealand’s first reinforced concrete structures and is the only significant remnant of the South Island’s largest industrial complex, Addington Railway Workshops in Christchurch. Addington Water Tower, Novemeber 2014. IPENZ. 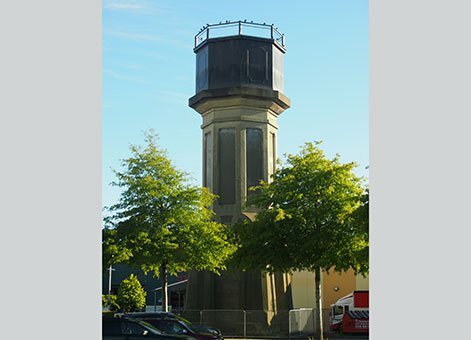 Designed by Peter Ellis of the New Zealand Railways Department, the tower was built in 1883 to provide a pressure water supply for the workshops. Construction was supervised by the designer’s brother, JA Ellis, a foreman in the government service, and prison labour was reportedly used. Addington Water Tower, 1990, IPENZ Heritage Photographs, Box 3. The tower was an innovative and daring structure built at a time when reinforced concrete was still novel. The tower foundation consisted of clay upon quicksand, and 23 centimetres of settlement took place by the time it was completed. 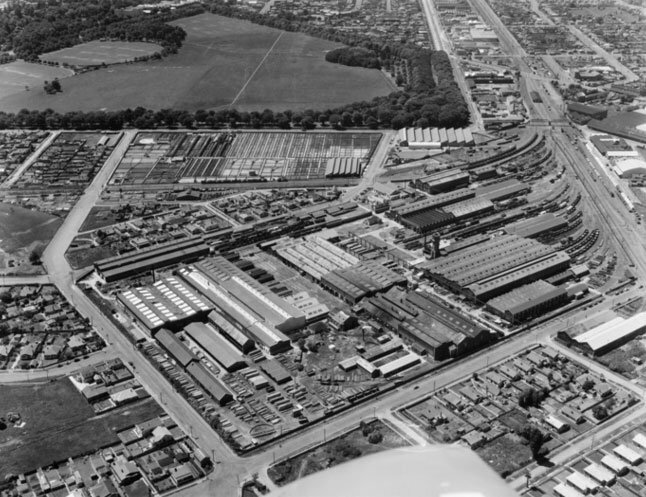 The workshops closed and were demolished in the 1980s. In 1990 the tower was still in use, although deterioration of the top iron tank had greatly reduced its capacity. However the concrete tower itself was in good condition and the concrete was sound. Addington Railway, Christchurch [November 1947], Whites Aviation Ltd; Photographs, Ref; WA-10863-F, Alexander Turnbull Library, Wellington, New Zealand. The water tower was also designed with earthquake resistance in mind. The centre of gravity was deliberately very low, even with the tank full of water, so that an earthquake would have to be very severe to capsize it. In 1964 a reinforced concrete ring beam was cast around the top as part of an earthquake strengthening programme. The tower seemed to come through the devastating Canterbury earthquakes of 2010 and 2011 relatively unscathed. This place has been recognised by Heritage New Zealand as a Category 1 historic place (List no.5390). This item of New Zealand’s engineering heritage was recognised as part of the IPENZ “Engineering to 1990” project, which the Institution organised to help celebrate the country’s sesquicentenary in 1990. A plaque was unveiled to mark the significance of this water tower as part of the development of the nation. Summary of work undertaken following the Canterbury earthquakes of 2010 and 2011. Thanks to John Radburn, Project Director for the Heritage Programme, for supplying this content. Addington Railway, Christchurch [November 1947]. Whites Aviation Ltd: Photographs. Ref: WA-10863-F. Alexander Turnbull Library, Wellington, New Zealand. The Water Tower remains standing at Addington, Christchurch, despite the closing and demolition of the Addington Railway Workshops. It is now part of the Tower Junction retail complex.